Owners, Rob and Paula Campbell-Taylor, bought the beautiful hilltop property in 2003 when the Cabernet and Syrah vineyards were in their seventh leaf. Raising their two sons in an enriched country environment was foremost on their minds along with producing excellent quality grapes to sell to local wineries. Selling the grapes however lasted only one year. 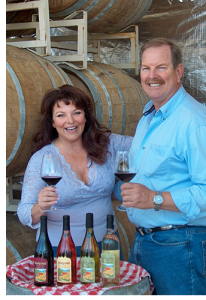 In 2004, they bonded as a winery and set their sights on bottling their own wines. The first bottling in 2006 was 184 cases. Rob, born and raised in Bakersfield, California, graduated from Fresno State University as a mechanical engineer. Now equipped with a 35-year engineering career and a passion for the wine and grape growing industry, his technical background serves him well as his top priority for Graveyard Vineyards is to maintain the highest quality and care of the vineyards. Paula, from a small town in Indiana, came to California out of high school when she was accepted to The Young Americans singing group. Chapman College in Orange became her new home and she continued to work in the entertainment industry both on stage and on management side. This grew into fine tuning her marketing and management skills and she was asked to write a bi-weekly column for the Santa Barbara Newspress while living in Santa Barbara. Paula oversees everything from the wine bottle to the consumer. She loves making new friends in the tasting room and our guests feel at home. Don’t be surprised if she offers you her homemade brownies on the way in, and hugs you goodbye on the way out. After Rob and Paula’s young boys finished raising 4-H animals, the original barn was torn down and the winery was built in 2011. Adjacent to the fish pond, the building still resembles a barn with big 16- pane red barn doors. On the back side of the winery is the crush pad where the grapes from harvest are brought in, fermented, pressed then aged in oak barrels in the chandeliered barrel room. This room also provides a perfect setting for Winemaker Dinners and intimate events. The cozy tasting room looks out to the fish pond and glorious sunsets. Open Thursday through Monday from 11 am to 5 pm, the dramatic indoor fireplace beckons people to relax, sit and enjoy a glass of wine and pass the time away on a cold winter day. When weather permits, the large barn doors open to a view of the picnic area and fish pond, where you can picnic tableside or on the dock and enjoy the peaceful time with friends and family. Graveyard Vineyards sits atop a picturesque hill on Estrella Road, one mile off Airport Rd in Paso Robles. Located at our big oak tree driveway, is the historic Pleasant Valley Cemetery. This landmark began back in the 1860’s, when the surrounding area of land was the town of Estrella and the original landowner donated an acre of his property for the new First Presbyterian Church. Once the church was built, the landowner’s wife passed away and was buried next to the church, creating the “graveyard”. Many town’s people followed suit until the church burnt down in 1896. Neither the town of Estrella nor the church lasted, but the little graveyard continues on to this day. It is now named The Pleasant Valley Cemetery and is cared for by community volunteers just as in the 1800’s. Beneath the old oak trees are memories of how our American ancestors created their own homesteads in the golden hills of California. We are reminded how our lives have changed over the past century by honoring the memory of these homesteaders.